If you are like the many millions of Americans who have more stuff than you do storage space, then Arrow Sheds may be the answer you have been looking for. Backyard storage is the perfect way to add additional square footage to your storage space. It is a very affordable method of increasing your space. Whatever you have to store; bicycles, children’s toys, pool supplies or lawn and gardening tools, you will find the extra space from an Arrow Shed quite beneficial. Some families are even building backyard sheds for playhouses for their children or the infamous “man cave”. Whatever the purpose Arrow Sheds will provide you with the right size and style shed to fit all of your storage needs. Arrow Sheds are an affordable option for your backyard storage unit. Looking at the other options available for storage, like public storage units or Pods, Arrow Sheds costs less in the long run. And your stuff is stored on your property so you simply just walk to the back yard to get the things you need. With storage facilities, you have the added inconvenience of having to drive to them in order to get the stuff you need. Arrow Shed construction is very durable. Arrow Sheds are made of galvanized steel, so they are one of the most durable sheds on the market. Galvanized steel won’t rust so you can expect a long life from your Arrow Shed. Galvanized steel will hold up better in bad weather, and the necessity for continued maintenance on it will be limited. You are given several choices for the sheds finished exterior. You can choose from baked enamel, electro-galvanized steel, pinewood or vinyl. You may want to choose the finish that best matches your homes outside décor. In addition to selecting the exterior wall finishing, you can also pick the roof style. Choices are sloped, gabled or gambrel. The ability to customize your Arrow Shed will help it blend in with the existing structures on your property. There are many sizes and prices to choose from. The Arrow YS47 is a 4’ X 7’ compact storage space that runs for around $378. This model is designed like a lean-to, and helps save space in your backyard because it can lean right up next to a wall or fence. 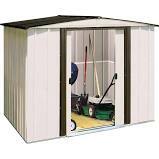 A great shed that is perfect for storing lawn equipment is the Arrow Utility Building. This 8’ X 3’ storage shed has 4 shelves and a tool hanger rack that will help you keep your gardening tools organized. The Arrow Woodlake model is a 10’ X 8’ storage shed that runs around $398. This model offers 413 cubic feet of storage space. There are double doors on the front that allow you to store large yard equipment. One of the larger models is The Sheridan which is a 10’ X 14’ shed that has double doors to allow easy access, and plenty of room to store large items. The Arrow Sheds can be purchased online at their website or at participating retailers. Some of the retailers who carry Arrow Sheds are Lowe’s, Sam’s Club, The Home Depot and Shed Nation. Pricing varies depending on where you purchase your Arrow Shed from. You can even check on Amazon and eBay to locate the best price. Assembly is required, but is very easy. Arrow Sheds are pre-fabricated steel pieces that are put together with a screwdriver and some pliers. There are easy to follow directions, as well as customer support available to you by phone. You can also visit their website if you run into any problems assembling the shed. The website has a great video to demonstrate how to properly assemble your new shed. Depending on your city’s code and ordinances, you may need to get a permit to put a shed on your property. So, to be on the safe side, check with them first. Most times it depends on the size of the shed you want to install. Arrow Sheds have either a 12 year or a 15 year warranty. If more storage space is what you need, or if you are looking for a shed to turn into a playhouse or workshop, Arrow Sheds will have the perfect sized and styled shed to fit all of your outside storage needs. Customize your Arrow Shed to match the existing structures on your property. Don’t let another year go by without finding a solution to your storage shortage, check out the Arrow Sheds.